The ETC and EAC formats are lossy compressed texture formats used mostly in embedded devices. 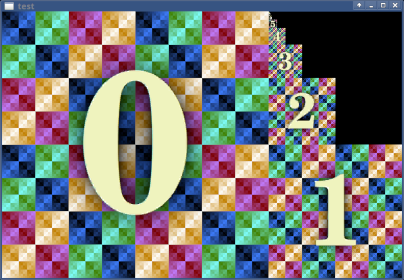 OpenGL implementations of the versions 4.3 and on, and GLES implementations of the versions 3.0 and on must support them in order to be conformant with the standard. In other words, the OpenGL/GLES implementations after these versions should allow the users to create compressed ETC/EAC texture images by calling the glCompressedTexImage functions, fill sub-images in textures using the glCompressedTexSubImage calls, copy data from ETC/EAC image sub-regions with the glCopySubImageData, read the pixels back from the texture with the glGetCompressedTexImage functions (and from sub-regions of the texture with the glGetCompressedTextureSubImage), generate and display ETC/EAC mipmaps and cubemaps and more. Some GPUs support the ETC2/EAC images natively. This means that they can sample the ETC2/EAC textures that have been previously generated by either compressing non-compressed pixel data (glTexImage) or by loading already compressed data (glCompressedTexImage) to render the images. Older GPUs, including some Intel Generation 7 (Haswell, Ivy Bridge) and some older ones like the Sandy Bridge lack this native support as they have more hardware restrictions. For these older GPUs to be conformant with the standards, (and for the user programs to not crash on them) the support must be emulated in the software parts of the driver. On mesa, in the i965 driver, we already had some sort of ETC/EAC emulation: we could read the compressed pixels (glCompressedTexImage) and decompress them to formats that the hardware could sample for the rendering to work. But this was quite problematic as the glGetCompressed. * functions would return decompressed data instead of compressed which the user program couldn’t handle. Also, operations like the copy of sub data or the mipmap generation wouldn’t work either. As a result, we had to abort every mapping of the ETC/EAC textures for reading with assertions, to prevent the user from reading or copying invalid decompressed values and as a result we couldn’t support many GL calls. There are many approaches we could have followed to fix this problem, but we were looking for the less “invasive” one, that would affect the less parts of the driver and would be simple to implement without many changes to the existing driver code. First of all a texture might have many levels. 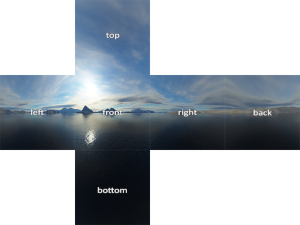 In the case of mipmap textures, the driver will use a different level for each image of the mipmap pyramid. In some occasions, a level might consist of different slices. 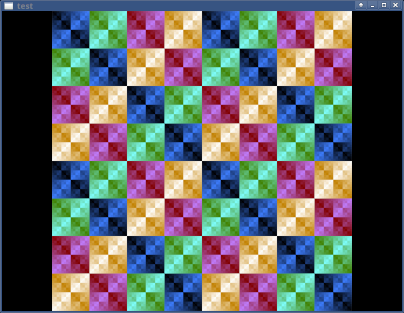 For example, a cubemap texture might have one level with six slices for the six images of the cubemap. Also, 3D textures might have slices that could be used to construct a volume for volume rendering and so on. In the i965 driver we store the textures as miptrees. 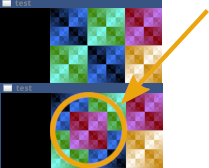 The miptree is the struct that contains (or points to) all the information that is needed for the texture mapping to work (about the color, the format, the dimensions, the number of levels and slices, the way the pixels are packed or unpacked, the tiling, the offsets, the usage and more). For the ETC/EAC textures, there was an extra field that was storing the original format of the texture before the decompression took place. The driver might map the pixels that correspond to a miptree level/slice on a surface (or a buffer) for different purposes. Sometimes the mapping is done for reading, either because the user performed an operation that reads the pixels from a level/slice, for example by asking the pixels back with a Get function, or by performing a copy from the texture (reading from the source to copy at destination) or an operation that involves reading pixels was performed on the driver like when some conversion (eg a compression or decompression) took place. Sometimes, it is done because a miptree slice from a level needs to be modified for example to update the pixel values of an image or of a subregion of an image or when a miptree slice is the destination of a copy or conversion operation. At the time that a miptree was about to be created, the ETC/EAC pixels were decompressed to a convenient format that the GPU could sample. 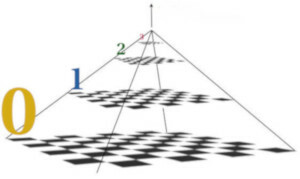 So the miptree would be constructed to contain information on how to map the pixels of a decompressed format. With this technique the rendering would work well (see the cubemaps on the video) as the GPU would perform the sampling from the decompressed data. But for several other operations, mapping a level/slice could eventually cause an unexpected behavior to the user program (which as I already said was prevented by aborting the unsupported operation). Each miptree of a texture contains a pointer to a generic purpose shadow miptree that can be used (if that’s necessary) to store additional information about formats that the GPU can’t handle in order to emulate them. This idea of the chained shadow trees belongs to Nanley Chery who reviewed the patches: in my first patch series I had used a completely separate miptree and tried to address the problem at the image level. Anyway, in this approach, no decompression takes place initially. 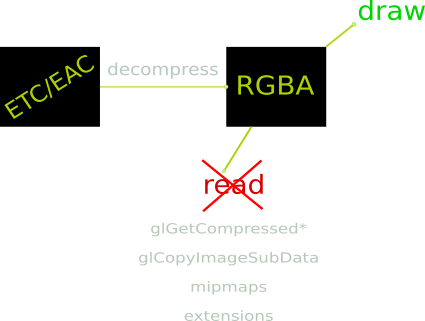 The user creates a compressed texture by calling one of the glCompressedTexImage functions and the driver creates the corresponding miptree to store the information about these compressed pixels. Every time the user queries back the data using the glGetCompressed. * functions, these compressed data are returned as they are, in the format the user expects. The driver then creates internally an empty shadow miptree, of the decompressed format we were using before, that is chained to the one with the compressed data. And after that every time that the compressed miptree is modified or filled with new data, the driver flags it so that the shadow be updated accordingly. 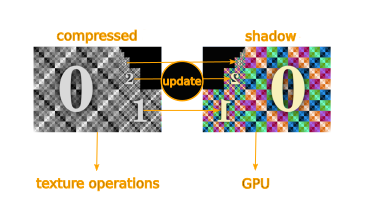 Before every draw call that involves compressed ETC/EAC textures on Gen7 GPUs, the driver checks if the miptrees have been flagged and if they have it decompresses the pixels of their levels/slices filling the corresponding shadows. Then it sends the shadows to the GPU. This way, the GPU will always sample decompressed data, but other operations that involve the original data can still be performed, and as a result more GL calls can be supported. Note that the reason that the update of the shadow trees takes place right before the rendering is to make sure that the texture data are always up to date (which is important after a copy operation for example). The obvious one: most user programs run well, without crashes as most GL calls are now supported and work with the compressed ETC/EAC data. Conformance tests that were previously failing now pass (KHR-GL46.direct_state_access.textures_compressed_subimage from the vk-gl-cts test suite). 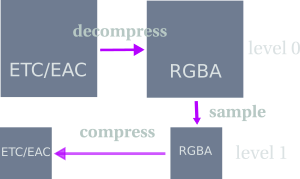 Compression is used to increase the speed of the texture operations and to decrease the use of resources. In our case, we use the double memory and we update the decompressed mipmaps before the draw call is executed. We know that this is slower. 🙂 But our goal was not to achieve the best performance of a feature on a GPU that lacks native support for the feature. Our goal was to allow the user programs to run on such a GPU without modifications, to pass the conformance tests and avoid any crashes from partially supported read and copy operations. The hardware spec is clear about which formats can be sampled by each GPU’s sampling unit and so, the developers are aware that the feature is not implemented in the hardware. VOL2_Part1 section 2.5.11 Format Conversion (vertex fetch). VOL4_Part1 section 2.12.2.1.2 Sampler Output Channel Mapping. VOL4_Part1 section 3.9.11 Render Target Write. One thing that was impossible to support in OpenGL is the automatic mipmap generation, as it requires native or at least software compression. (For the case of the GLES the automatic mipmap generation is required for color formats only and so, there’s no need to support it). There are two ways to generate mipmaps using OpenGL. The first is by loading an image for each mipmap level (with TexImage or CompressedTexImage for each level) as in the example program of the video above (see also example programs below). The second, is to only provide the image for the first level and ask OpenGL to generate images for the following N levels (with one of the non-depricated ways mentioned here). The implementation of the second method requires to sample each level to generate the next. As we can’t sample the compressed image of the first level (lack of native support), the only alternative hack to do would be to decompress it and sample from the decompressed. But then, in order to have both the compressed and the decompressed data for the next level for the GetCompressed* and copy functions to work, we would need to re-compress the sampled decompressed data. We decided to not implement this feature as the software compression of ETC/EAC formats is not implemented on mesa and so far not required. The mipmap test is loading different dumped mipmap level images and displays them on a window. All the above tests load the same dumped compressed texture image (see picture below). The first test displays it as it is and then reads back the compressed data using the glGetCompressedTexImage2D to compare them with the submitted ones. The second test overrides a small region of the texture (upper left corner where you should see a red quad) and reads the compressed pixels of that subregion for comparison. Its purpose is to test that the data returned by the glGetCompressedTextureSubImage2D match those the user sent with the glCompressedTexSubImage2D. The 3rd copies a yellow quad region of the texture in the upper left corner again, where you previously would see the red, by calling the glCopyImageSubData. 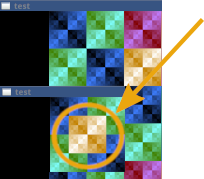 The cubemap test only displays a cubemap. As I already said, the rendering was working before. The test was to make sure that it still works well now that the secondary mipmap tree is sent to the GPU. Note that all programs require the freeglut library (freeglut-dev on Debian/Ubuntu). My initial idea to fix the emulation was to do a quick and “simple” hack: store the compressed data in a secondary tree as at the time we were using a tree with decompressed data as main, leave the rest of the code as it is and use flags to decide which one I should map every time that a map takes place. This “quick hack” required changes in the higher level i965 image functions that I managed to avoid in the final solution. The idea to use a generic purpose secondary miptree to emulate different formats that we can’t sample, belongs to Nanley Chery who used this type of shadow miptrees in his r8stencil and ASTC formats emulations and who also reviewed my final patch series. I also received some help from Kenneth Graunke with whom I had discussed the problems I faced in my previous design and who suggested that I enable the OES_copy_image extension after I finish the work on the ETC/EAC support. Finally, many people from my team (Sam, Alejandro, Iago, Andrés and Juan) made useful remarks during my previous attempts to fix the problem. Is there a programmatic way to determine which compression type a given hardware supports? The emulation requires more memory than using an uncompressed format directly (as we have the compressed data *and* the shadow), has some computational overhead, and uses the same bandwidth as uncompressed. For performance critical stuff, one of the BCn formats would be the better choice then. Not as far as I know. The extension you would normally use to check if a format is supported (https://www.khronos.org/registry/OpenGL/extensions/ARB/ARB_internalformat_query2.txt) doesn’t make a distinction between the emulated and the natively supported formats for the moment.